SME4SPACE is a not for profit organisation registered in Leuven under the Belgian Law. The aim of SME4SPACE is to voice Space SMEs’ viewpoint in a coordinated way and to facilitate the access of SMEs to space activities in general and to ESA and EU programmes in particular. carrying out research projects, participating at National, European and International calls in space and related activities. 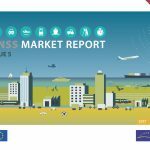 In particular the task of “Dissemination and Exploitation of Project Results” (under the voice “Impact”) suits very well the characteristics of SME4SPACE, being able to provide an added value thanks to the large number of SMEs it represents as well as the wide geographical coverage. 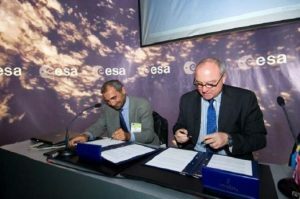 SME4SPACE was originally launched as an informal group of Space SME Associations on June 2007, during Le Bourget in Paris, when ESA General Director J. J. Dordain and the former SME4SPACE Chairman, G. Sylos Labini, signed a Memorandum of Agreement (MoA). From that moment, SME4SPACE has increased its representativeness, gathering more and more Space SME Associations and Space SMEs. 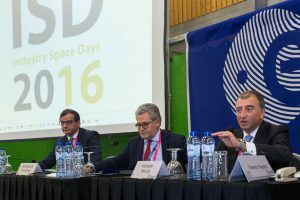 Recently, during the Industry Space Day 2016, ESA and SME4SPACE signed a new MoA, strenghtening their collaboration. Go to Join us page in order to know how to become a SME4SPACE Member. Please download the SME4SPACE Statute to get a more complete idea of our Association.